This is the second in a series of short essays I'm writing to highlight relevant design lessons we can derive from Super Nintendo games—specifically the ones I'm playing on my SNES Classic Edition. Check out the introductory post here for some additional context. There's one thing you were supposed to know about Star Fox way back in 1993. Look—it's right there on the box. Star Fox was Nintendo's answer to the looming 32-bit era: a Trojan Horse for a new type of Super Nintendo game cartridge sporting an extra bit of processing power. The Super FX chip enabled the SNES to squeeze out mere dozens of polygons on-screen at a frame rate that'd barely pass as playable in a modern game. But at the time? It was kinda neat. In 1995, Sony's PlayStation and Sega's Saturn arrived on the scene with their fancy 32-bit processors, built-in CD-ROM drives, and ability to crunch thousands of polygons at a time. Saturn didn't fare so well, but PlayStation was a major success, and it stole Nintendo's place as the vanguard of innovation and quality in console gaming for two generations. But back in 1993? Things were far less certain. I was seven years old, and Star Fox gave me a whole lot to think about. Nintendo did something pretty cool with the Super Nintendo Classic Edition: it includes the first-ever official release of Star Fox 2, a game Nintendo essentially completed but decided not to launch due to the changing console landscape (and, I think, a tacit omission that the Super FX chip couldn't hold a candle to the next console generation). Anyway. In order to "unlock" Star Fox 2, you first have to complete the first stage of the original Star Fox. I wasn't looking forward to this. Look: I dunno what it is, but for whatever reason, I don't have fond memories of Star Fox. I got it when it came out, played through it a couple times, and bounced off it almost immediately. It was short and felt unfamiliar, and for good reason—I don't think I'd played a fully 3D game before and I had no idea what to expect. Apparently that disappointment never dislodged from my emotional memory, but—well, I figured I could spare five minutes on a game I barely tolerated in order to check out the one that was never released. And—wouldn't you know it?—I wound up playing through the whole game. Twice. Star Fox is really, really good, y'all. Even today. And I was super wrong about it all along. Here's why. Imagine you, like seven-year-old me, had never played a 3D game before. You were vaguely aware of the concept of polygons, but every game you'd played up to that point used bright, evocative, flat sprites to illustrate their worlds. I used to think of Super Mario 64 as my introduction to 3D gaming. It featured open worlds, non-linear challenges, positional audio, and joyful, liberating motion. But as revolutionary and eye-opening as that game was for me, I realize in hindsight something else had primed my brain for this new generation of games. And, well, you probably see where this is going. Star Fox could have been an absolute disaster if its designers hadn't considered the necessity of acting as a gateway for players to the concept of 3D games. Giving players a third dimension to consider goes beyond mere control challenges: you also have to reconsider how the game communicates with the player through audio cues, visual elements, and explicit/implicit instructions. In 1993, I didn't have a critic's eye for these things. But in 2017, I'm a little better at it, and I can finally appreciate just how brilliant this game really is. Here are the lessons that resonate with me the most. 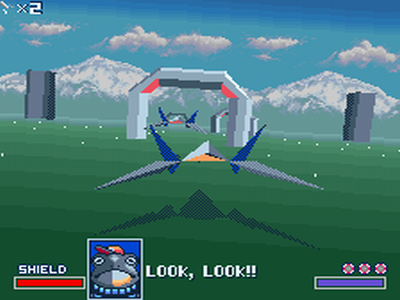 Boot up Star Fox and the first thing you'll see is an armada of low-poly ships advancing at a ponderous pace toward a tiny blue planet while ominous music plays. Next, it cuts to the title screen, where a brief fanfare plays and Fox and his crew are shown. This sequence directly conjures up familiar memories of the opening scene of Star Wars; in turn, this tells you exactly why you're here. The message is clear: bad stuff's going down in space, and you're gonna have to blow some things up to set it right. From there, you'll jump to a screen that lets you get a feel for flying your Arwing in an open field without consequence. This is handy—it builds a lot of confidence in a mere matter of seconds. You emerge onto the Earth-like surface of Corneria, and the music takes an upbeat tone. Your team checks in during a brief cutscene (hey, did I mention this Super NES game from 1993 features dramatic cinematography and scripted cutscenes?) and before you know it, you're in control of Fox's ship. The tone of this sequence is designed explicitly to boost the player's confidence and get their blood pumping. This is exciting! You're flying a cool starship! Do a barrel roll! In the span of a minute, this game teaches you everything you need to know: why you're here, how you play, who's on your side and who's not. The rest is communicated gracefully through expertly paced levels and very obvious visual cues, which usually boil down to: if it's flashing, you should probably do something about it. A small note, but a significant one: Star Fox features very intuitive controls. This was a pleasant surprise back in 1993, but in 2017 it's actually pretty impressive. Remember that the Super Nintendo controller was digital, not analog—that is, all its inputs either registered as "on" or "off" with nothing in between. Imagine driving a car or flying a plane with all-or-nothing control inputs—it's nightmarish. Star Fox's developers clearly put a lot of time into getting the feel of controlling your ship just right: flying through worlds, aiming your cannons, and dodging obstacles feels intuitive and graceful. It's remarkable to me, now that I have decades of experience with analog controllers, flight sticks, and even full-motion VR controllers, that I felt fully in control of my Arwing's actions while playing Star Fox. Every time I took damage, I knew it was my fault. Every time I emerged from a boss fight unscathed, I also knew I'd earned it. Every game experience is going to be subject to the constraints of its platform. If there's one lesson to pull from this anecdote, it's that time invested in nailing an intuitive control scheme is always time well spent. The top priority of Star Fox's design was teaching the player what it means to succeed in a 3D play space. And really, there was a lot to teach. In most 2D games, if things get complicated or you want to reassess your strategy, you can simply stop moving on the screen and study your surroundings. Your viewpoint is consistent, and all the information you're expected to be aware of is, with few exceptions, always right in front of you. By contrast, in a 3D game, you only have one viewpoint out of an infinite number of other perspectives—and thanks to your ship's constant propulsion, that viewpoint is always changing. For the average player, this automatically ratchets up the tension substantially, and it doesn't let go. So in order to thrive in this new space, the player needs to learn how to read what's happening and identify what helps—and what doesn't. Positional Audio: The Super Nintendo was just capable of stereo sound, but thanks to some clever sound design (by legendary composer Koji Kondo, no less!) it's also very easy to tell when an enemy ship is sneaking up behind you or flying in from off-screen. It's so subtle that I didn't even realize I was picking up on it until the end of my first playthrough, but it's crucial information for survival, and it greatly enhances the player's immersion. Crewmate Cues: Your crew depends on you, and it's also there to teach you how to read your surroundings. In the first level, Slippy guides you through a series of arches; follow him and you're rewarded with a weapon upgrade. These cues make your crew feel present and useful, and the frequent opportunities to bail them out when they're being pursued by enemies makes the player feel a bit more invested in their role than if they'd been a solitary pilot. There is one significant flaw here, though: your crew's messages are typed on-screen, not spoken, which makes it hard to keep up when there's a lot of action happening. Fortunately, Star Fox 64 fixed this by including voice acting throughout the game. If it wasn't for this deep, far-reaching attention to detail, Star Fox could've just been another arcade-style shooter like Space Harrier: flashy but ultimately soulless. But Star Fox brings it all together—its heroic soundtrack, its intuitive controls, its simple-but-clear visual style, and the player's understanding of the gravity of their role—to create a profoundly confident and accessible experience. Simply put, Star Fox excels because of its strong tonal consistency. It deftly introduced an entire generation of people to a new paradigm in game design, and it remains a joy to play nearly 25 years after its release. You'd be hard-pressed to find another 3D game from the era that still brings it all together so well. Ok, besides Star Wars: TIE Fighter.